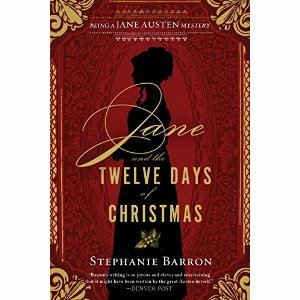 Jane and the Twelve Days of Christmas is the latest in a long line of Jane Austen mysteries by Stephanie Barron. In this series, Austen is something of a Miss Marple character (but younger). Jane runs into murder everywhere she goes (prompting considerable teasing from her family). Since this is a mystery, someone has to die, and someone from the part must have done it, but who? This is a cozy mystery, and it’s a little bland – on the other hand, it’s not too dark or disturbing for holiday reading. The real delight here is the description of a Regency Christmas. I also got way too much enjoyment from the doll clothes that Jane and Charlotte make for their niece. On the first day of Christmas they give her a doll. Each subsequent day brings a new outfit. This was enchanting on many levels – it was sweet, it felt magical and fun, and the descriptions of the outfits are both lovely and educational. Similarly, in this book we hear about the Yule Log, the Children’s Ball, and of course Charades. This particular book is out in time for Christmas shopping, and it’s in a lovely hardback edition with a deep red background and gold writing. Clearly the marketing department knows a good gift when they see one. I’d say this book is for a particular reader – a Jane aficionado, but not a Jane snob, since I think the version of Jane we are presented with is much less acerbic than the actual Jane was. I enjoyed the book greatly as a relaxing, interesting read that got me in the mood for the holidays. Having said, that, it’s nothing terrible brilliant or exciting or deep – which is just as well. During the holidays I’m much more capable of enjoying a light book than something new and deep! This entry was posted in Book Reviews and tagged Jane and the Twelve Days of Christmas, Jane Austen, Jane Austen mysteries, Regency Christmas, Stephanie Barron.